Transpiration – The process when moisture evaporates from vegetation. Sublimation – When snow or ice turns to water vapor without becoming water first. Condensation – The process in which water vapor turns into water. 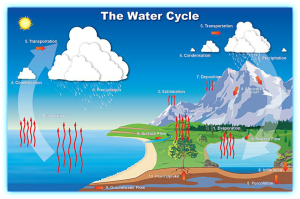 Transportation – The movement of water through the atmosphere. Precipitation – When water is released from the clouds in the form of rain, snow, hail and sleet. Infiltration – The process in which precipitation on the ground surface soaks into the soil. Percolation – The collection of water underground as a result of infiltration. Surface Flow – Water from rain, snowmelt or other sources that flow on top of the land. Plant Uptake – Moisture in the ground is absorbed through vegetation and majority evaporates through the plants. Irrigation – Applying water to crops and soil artificially by diverting water from its original source. Reservoirs – An artificial lake where water is collected and stored for different uses. Commercial – The use of water by businesses and organizations. Domestic – The indoor and outdoor use of water by residents of households. Every water system starts at the source. all of the water sources used by KCWCD are from wells that extract water from underground aquifers. The water is pumped to a treatment plant where chlorine is added to the water for disinfectant purposes. The water is stored in elevated tanks. From the tanks the water enters the main lines and is given water pressure through a gravity fed system. Climate – The climate in Kane County is fairly dry and has experienced drought in the last couple of decades. Future Growth – The county has grown tremendously in the last decade and will continue to grow. With dry climate and more people moving into the area, its important to remember that water is a non-renewable resource and the importance of respecting our water source. Ways to Conserve – There are many different ways in which we can conserve water. The easiest way to conserve is to be conscious of the ways we are using our water. When we pay attention to the water we are using, it is easier to see how much is really going to waste. The links above will give you access to a couple of different resources available to print off and use for your own educational purposes.